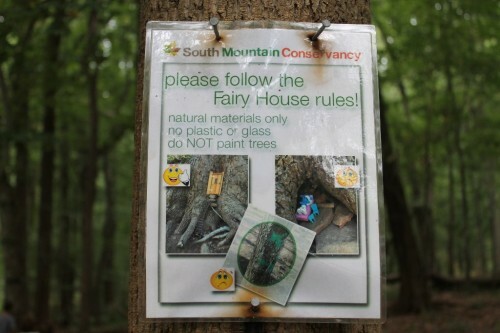 We love South Mountain Recreation. There’s so many things to do there that are family friendly. 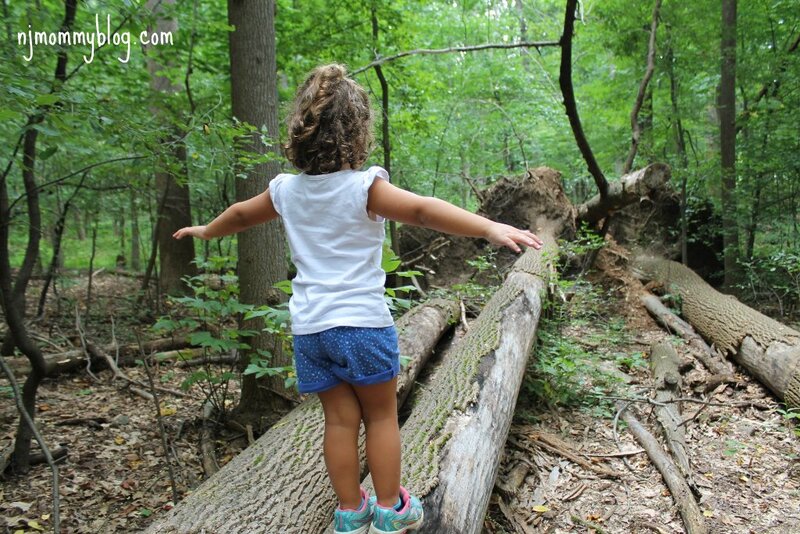 It’s home to the awesome Turtle Back Zoo and the beautiful Regatta Playground. 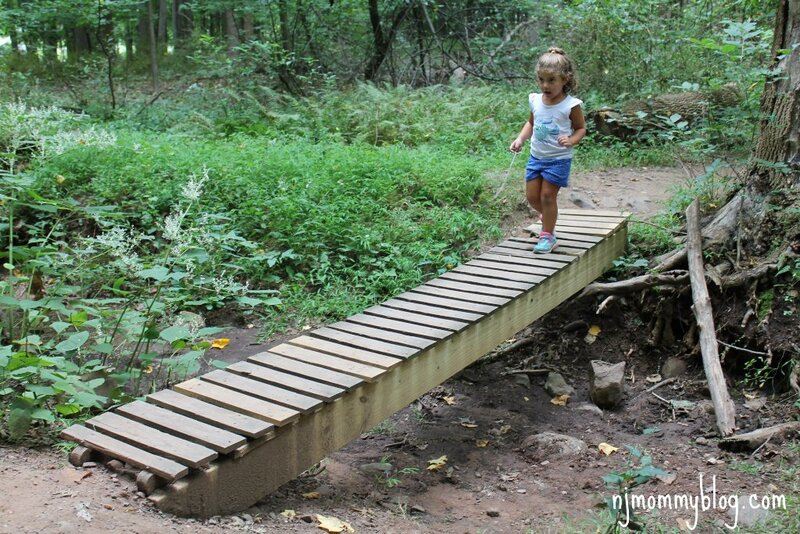 There’s pedal boats, Safari Golf, and great hiking trails, too. 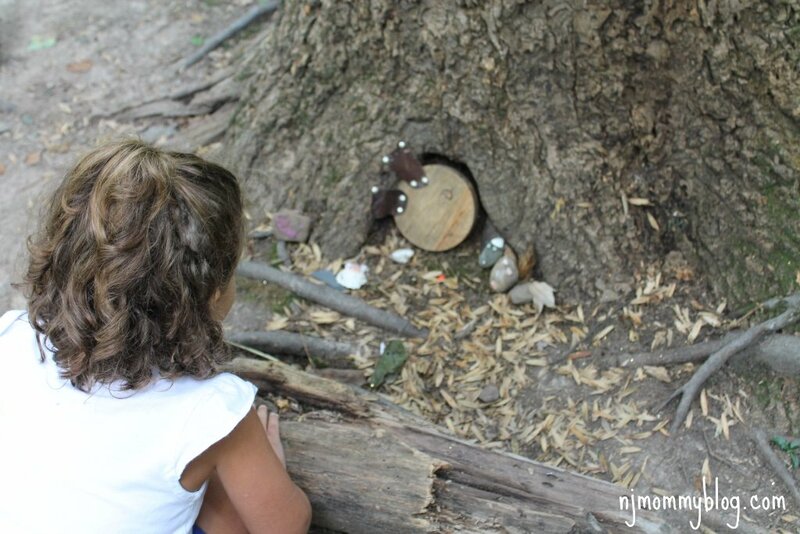 When I heard about the Fairy Trail at South Mountain Recreation in Millburn, NJ, I knew I had to visit. I’ve always found the idea of fairies enchanting. As a child, my love for fairies began with a light pink fairy costume I wore in Kindergarten for Halloween. As a teen, I had a whimsical collection of fairy figurines and books. In my adult life, I rekindled my interest in fairies teaching my students about the mischievous sprite Puck in Shakespeare’s A Midsummer Night’s Dream. 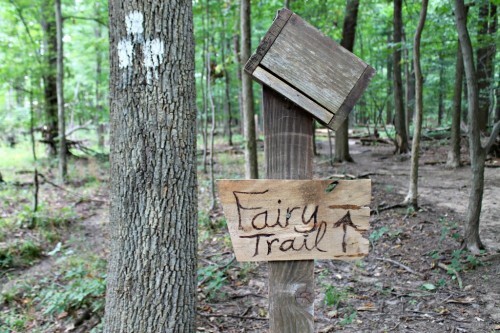 Even before visiting the Fairy Trail, I was pretty sure this would be an adventure as exciting for me as it was for my kids. 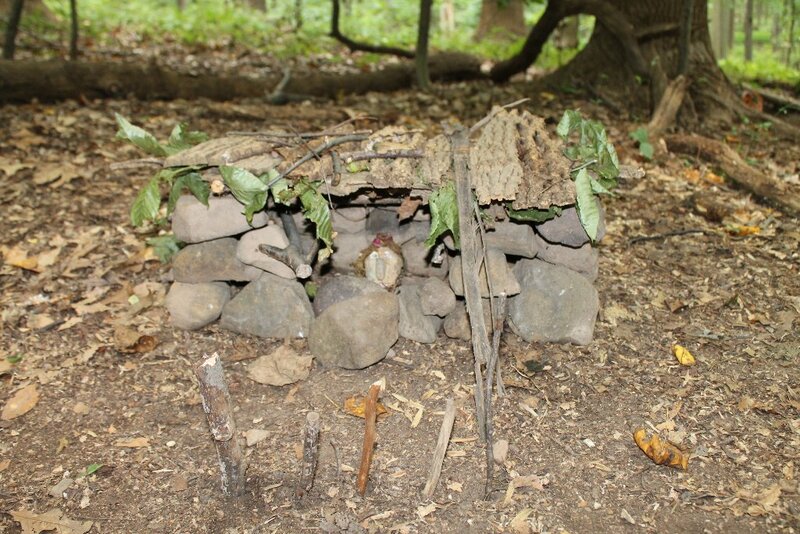 Use GPS directions to 200 Glen Ave Millburn, NJ. Park in the Locust Grove Parking Lot. We visited on a Saturday around 12:00 pm. 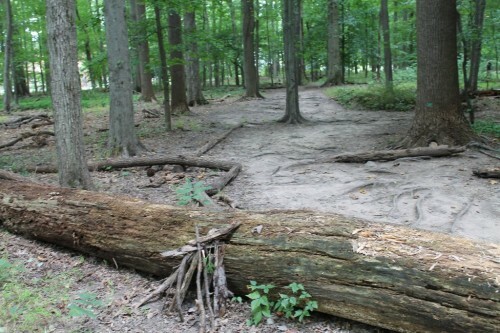 There is a narrow driveway to the Locust Grove parking lot which was filled with cars parked on both sides and appeared full; however, as we traveled further up the driveway there were several vacant spaces available. 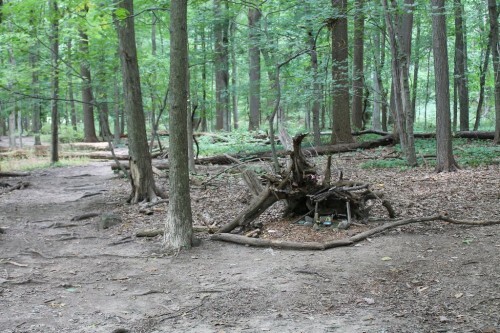 The Fairy Trail is the Rahway Trail in Locust Grove marked with 3 squares in a triangle pattern. The entrance to the parking lot is across from the Millburn Public Library. 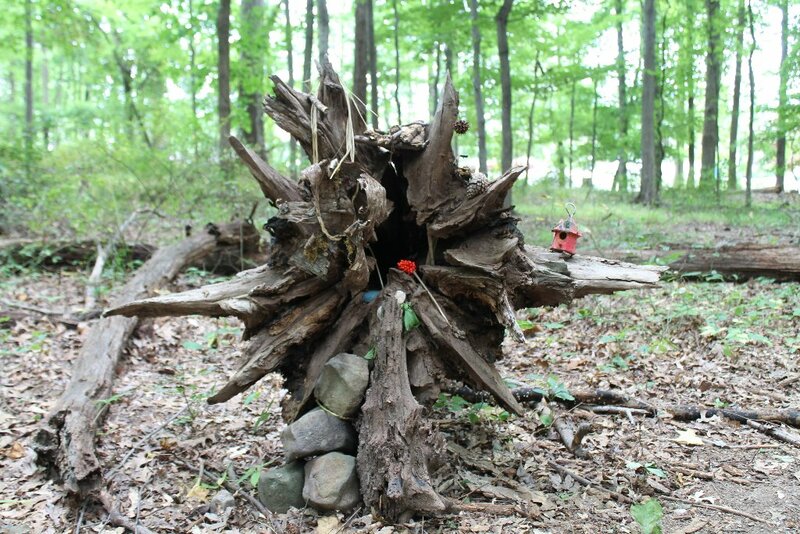 Therese Ojibway, a now 60 year old special education teacher, started building the intricate fairy homes about five years ago. 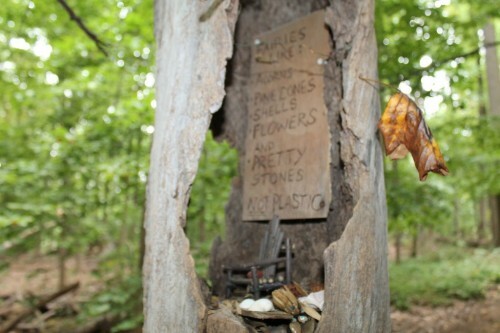 Since then, she has maintained the delightful fairy homes and many more have been added by new visitors to the trail. 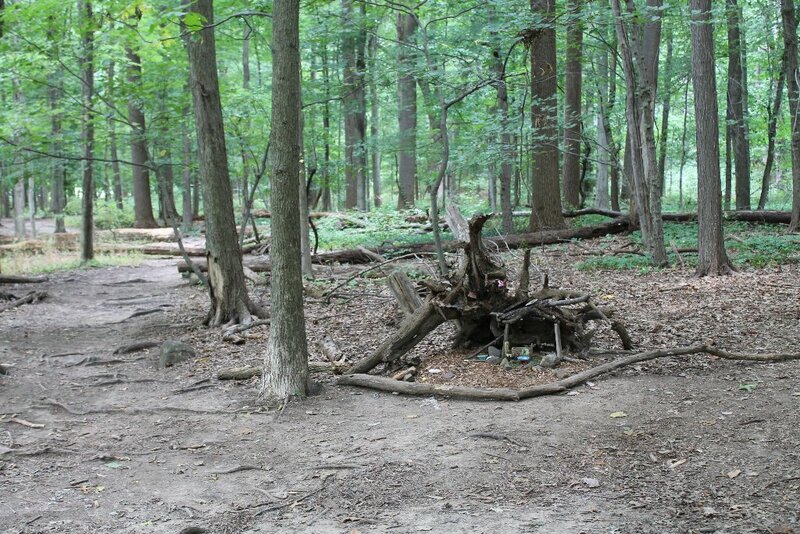 The Fairy Trail, or Rahway Trail, is a 2.25 mile long hiking trail. You can walk the trail following the entire Rahway River loop or you can turn around at any point making it a shorter more kid-friendly hike. Aside from passing many enchanting fairy homes speckled throughout the woods, you will also pass Hemlock Falls and Maple Falls Cascades, depending on how far you walk. 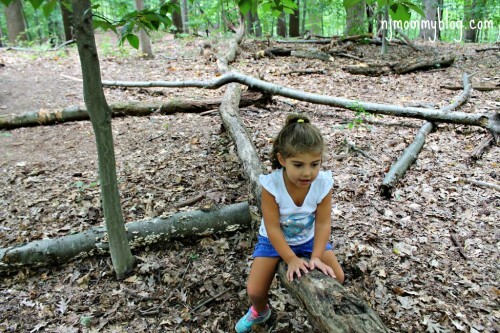 With my 3 year old and 1 year old (my husband carried), we walked about a mile of the trail. There were at least 30 fairy homes along the way to stop and admire. Also, look for logs to use as balance beams, a natural see-saw made of fallen trees, and a wooden “troll” bridge to cross. 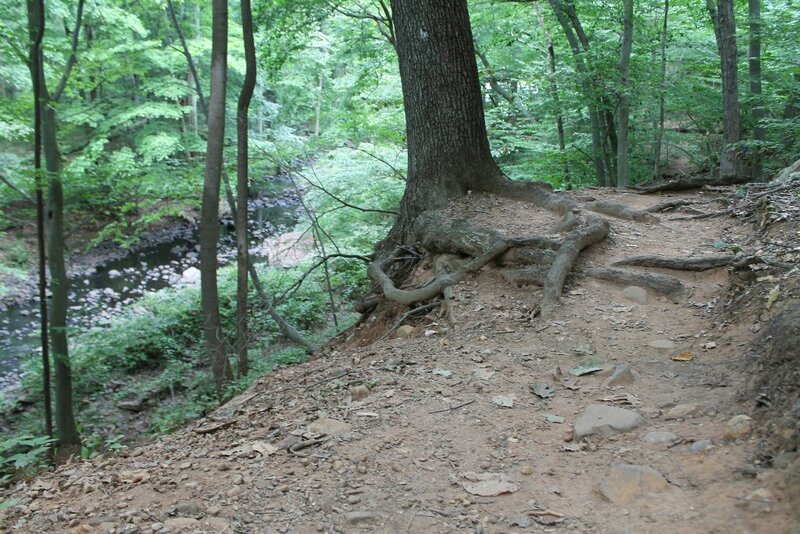 This is an actual hiking trail. Although the terrain is not too difficult, I would certainly recommend sneakers/hiking boots. 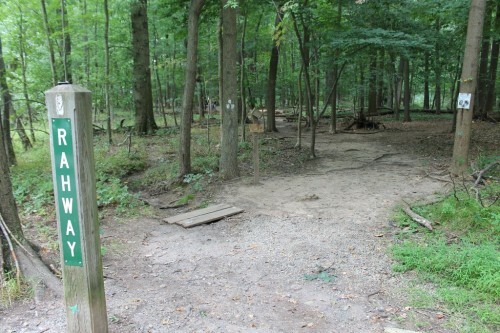 The trail is not stroller friendly. There are no restrooms along the trail. You might want to bring a backpack with water and other necessities. You can bring/make your own fairy home to add to the trail, however all materials must be natural and biodegradable. I loved seeing the excitement in my daughter’s face as we discovered each fairy house tucked into it’s natural surroundings. 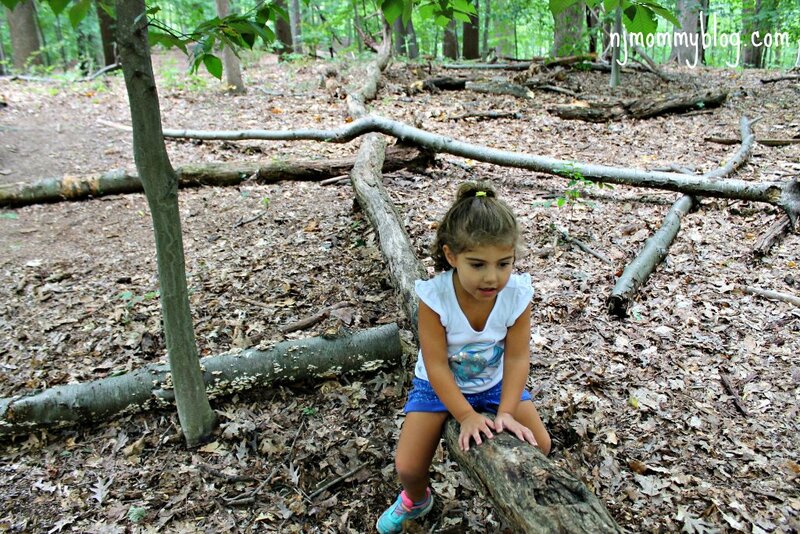 The trail was busy, but peaceful, and a great way to spend quality time with the kids. If you need a little enchantment in your life, strolling the Fairy Trail at South Mountain is the perfect way to spend an afternoon. 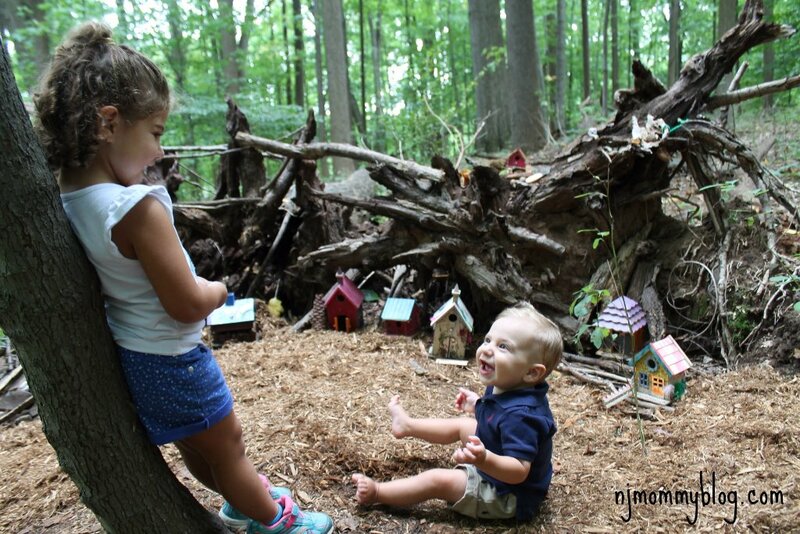 Posted in Family, Family Day Trips, Free Stuff, Kid-Friendly NJ Activities, Travel. 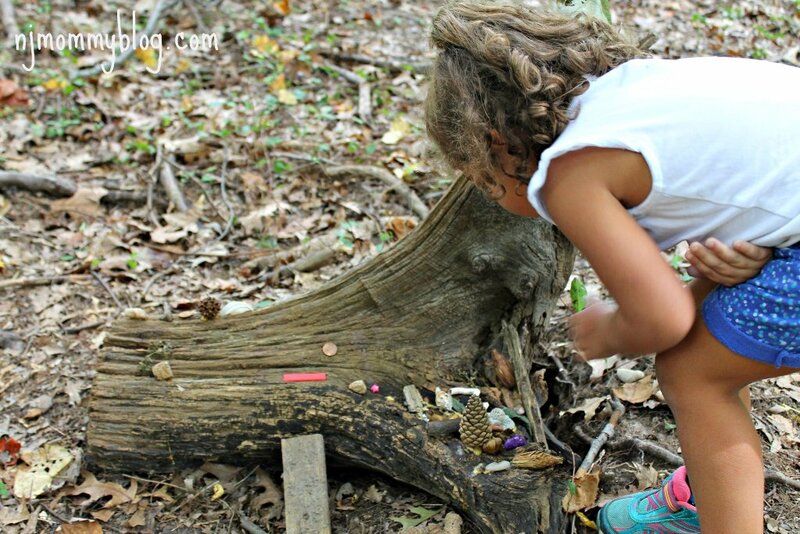 Tagged essex county, fairy walk, fall activities, hiking nj, kid-friendly activities, millburn, NJ, outdoor activities, south mountain recreation, West Orange.